This post is part of a series that explores questions that a good business analyst will ask. This is Question 5 of 8. What are the Risks that I’m Willing to Take? Risk is a four-letter word that many clients want to avoid. But, as Business Analysts it’s our job to understand the risk. So, let’s think about it from an enterprise position. Understanding risk is a good thing. 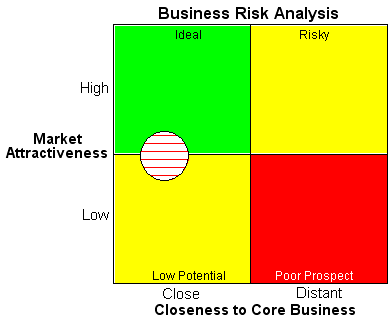 Risk serves as a component of the SWOT, PEST/PESTLE. The key here is to understand the core business and then analyze the risk involved to bringing the product to fruition. For example, let’s say an Internet design company wants to add marketing as a product line. A key question to ask is how close is that new product line to the core business? 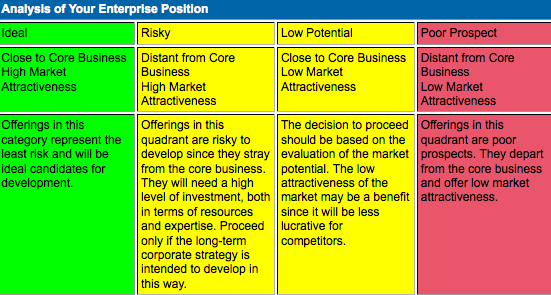 The folks at Intelligent Software for Business Planning have created an Analysis of Your Enterprise Position table. Look at it. An ideal Enterprise Position aligns well with your current product offerings. The market is ripe and can be developed. When working with a new product or channel, ask yourself the questions that are on the table. Doing so will put you in a position to better understand the amount of risk involved when beginning a new enterprise.